The well designed spacious Casita Almendra, has been awarded a tourism licence by the Andalucian Tourist Board. It is set within a peaceful, secluded location, amongst rolling hills and olive trees, close to the picturesque market village of Algarinejo, with its many bars and restaurants. 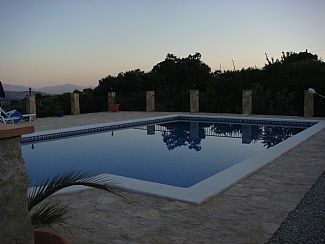 The casita is situated just 45 minutes west of Granada Airport and approx 1 hour 20 mins from Malaga. It is located in the large, gated grounds of a Cortijo and has the private use of the larger than average tiled swimming pool. The pool area has tall, stone built walls, allowing sunbathing in total privacy. The casita is ideally located, being within easy reach of Granada, it is situated close to the historic town of Priego de Cordoba, Montefrio and Rio Frio which is well renowned for its trout fishing. There are many different varieties of wild birds, which include the Hoopoe and Golden Oriel. Well sign posted walks are on the door step. The casita is ideally situated to visit the historic cities of Malaga, Granada and Cordoba so the Alhambra is a must, if you are visiting Granada. There is full Wi-Fi connected which is free for clients use. All UK TV channels are available to watch on the flat screen television in the casita, so never miss a football match or Wimbledon. The en-suite bathroom has a large 1 m2 shower, toilet and wash basin in white as well as a fan. Shower toiletries provided. The open plan sitting, dining and kitchen area is approx 26 metres square. Included in the sitting area is a leather suite, coffee tables as well as lamps and a rug, New 32 inch flat screen TV with Sky and DVD player as well as CD. Free Wi-Fi connection. The well equipped kitchen area has spacious storage cupboards with granite work surfaces as well as a large fridge/freezer a range type stainless steel gas range type cooker, microwave and toaster. There is also a dining table and four chairs. The ski resort of Sierra Nevada is within easy driving distance from the casita. Antequera golf course is an hours drive away. The golf course overlooks the town and has beautiful scenery. Notes on accommodation: The large casita has full private use of the pool. Heating is provided in the form of slim panel electric wall heaters during the winter months. Fans are provided in the summer for the bedrooms. All the windows and doors have fly screens to enable a warm breeze to flow through the casita in the spring and summer months. Outside: The large private tiled pool is 11 metres x 7 metres with easy access down into the water via wide steps. It has underwater lighting installed for night swimming. The private pool is for the exclusive use of the casita. There is a tiled shower by the pool. There are sun loungers, tables and umbrellas as well as a large wooden built shaded area on the south facing terrace around the pool. The private terrace of the casita is equipped with a granite table and wrought iron chairs, along with sunbeds as well as a large gas barbecue. There is a shaded sitting area in the casita garden for dining out or for just sitting and admiring the views of the mountains and olive trees and many wild birds. Cleaning / Towels / Linen / Maid service: Towels and linen included in the rental price. Clean towels every 3 days. Cleaning once a week or more frequently if required. Bed change is once a week or more frequently if required. Pool towels can be provided by the owners -please advise when booking. Other: Small provisions store with essentials and honesty box. Washing machine for sole use of the casita clients. Quite...peaceful...private...clean wonderful accommodation...nice having the cleaning done bed and towel change. Welcome pack on arrival with ice cold beers and a bottle of wine included. It's the 6th year we have been ...so we should love it! Peace and quiet and we love the village and surrounding countryside. Well positioned for trips out, as Casita Almendras is so central to so many interesting places. We will be back next year! We had found a corner of paradise, the casita was beautiful and had everything needed for our stay and was so clean. Sue was lovely and made a great paella and a wonderful evening of company and drinks. It was lovely to meet Sue's dogs and cats who were a joy to be around. Awww ... Thanks J and D for your review...that was lovely of you! The clan are missing their treats! Thanks for all their pressies and mine as well! I'm so glad that you enjoyed your stay here....so that you could re charge your batteries....ready for retirement!!!!! This was our first visit to Spain and we were not disappointed. This holiday home is just perfect, spotlessly clean with the most amazing swimming pool. If you want to chill out and relax this is the place for you. Sue the owner is so helpful but discreet and is the definitely the hostess with the mostest, she did the most delicious 'Paella' for us ..... we had a great evening. A wonderful holiday, we will definitely be back if we can get a booking! The casita was really well equipped, has stunning views, was exceptionally clean and beautifully furnished. Algarinejo is a lovely place with exceptional restaurants and good cafe bars. Great family run supermarket here too. Casa Piolas is probably the best restaurant in Andalusia and La Huella a great modern gastrobar. Also loved Montefrio and good tapas to be had at Bar Tokio in Ventorros. Sue was really helpful when needed and invisible when not but always available by phone/whatsapp. Would recommend to anybody and will definitely be back. Can't recommend this place highly enough! Beautiful setting and fantastic pool...all we had dreamed of. The bird life was amazing and we even had Golden Oriels nesting in a tree near by. Fantastic walks right on the doorstep. Spacious well thought out casita that was spotlessly clean and well maintained...it also had the WOW factor. We loved the fact that the WiFi reached to the pool terrace. We hardly saw the owner Sue...but we knew she was there if we wanted something..in fact we borrowed some herbs to use on the food that we cooked on the massive BBQ. We couldn't believe that the local restaurants could give you so much free tapas - even with a soft drink . The water fall walk in the village was beautiful. Loved La Huella and Piolas - food exceptional !! Thanks Sue for a fantastic week of relaxation...we will be back next year!!! The Costa del Sol with its many beaches and the historic town of Malaga with its galleries and museums are 1 hour 20 mins driving distance away. The Lake at Iznajar with its wide sandy beach, fresh water and beach bar is 40 mins away. There is eay access to the beach and water front by car. Granada airport is 50 mins away and Malaga is 1 hour 20 mins. Car hire is essential. Please contact the owner for a 15% discount with a car hire company at Malaga airport. An upgrade is also included for clients booking car hire 30 days before arrival. Before arriving if your require provisions, please follow directions and when you come off the motorway at Loja - call at Lidl or Mercadona which can be found on the left hand side at the first roundabout. The nearest village of La Vina with a supermarket is 5 minutes away. The market village of Algarinejo is 10 minutes. Ventorros de San Jose with the Dolman tombs is 10 minutes. Rio Frio with its trout fishing is 25 minutes away. The historic town of Priego do Cordoba is 25 minutes. The town of Loja is 25 minutes. Granada with its famous Alhambra palace is 1 hour. Zagra with its castle is 10 minutes away. Please note the above are driving times. Local shops, restaurants and banks can be found in Algarinejo as well as an award winning restaurant. All the other villages have retaurants, shops, banks with cash machines. All restaurants serve the local food. Local markets are - Ventorros de San Jose is on a Wednesday morning. Algarinejo on a Saturday morning. Zagra on a Thursday morning. Bike hire can be booked at Priego de Cordoba or Rute to fully explore the beautiful surrounding countryside. Leisure activities such as golf and horse riding are within easy access of the casita. The area is popular with bird watchers, walkers and botanists as there are a variety of unusual plants like wild orchids to be seen, especially in the spring in April and May. The Wolf Park at Antequerra is approximately 50 minutes drive away and tickets can be booked to hear the twlight howls.Please book tickets for the Alhambra Palace in Granada on line before you come as the summer months are usually booked up very quickly. There is a small provisions store at the casita, which includes all the essentials you will need if you decided to stay in and cook on the BBQ. Booking Notes: £100 (UK pounds) cheque or bank transfer, per week is the deposit required on booking. I now also take payments via Paypal. If you wish to send payments via Paypal ( use credit cards etc.) please send via my email sue.casitaalmendras@gmail.com (please don't send to my contact email) The remainder of the monies due, to be paid in Euros on arrival, or by bank transfer in sterling 4 weeks before your arrival date. Please email the owners for further details. The deposit is non refundable. Changeover Day: Preferred changeover day is Saturday - but this can be flexible and is not written in stone. During your stay the towels will be changed mid week and bedding changed after 7 days. A welcome pack, including wine and lager, is provided in the casita. Notes on prices: Prices from 375-425 pounds per week.